The NHS in England is on "high alert" to make sure there are no failings as it gears up for the biggest change in its history, the head of the NHS says. In an interview with the BBC, Sir David Nicholson said the coming months were "significant". The health service is currently busy getting ready for the government's reforms to go live in April. Sir David said he was determined to make sure care did not suffer during the changes and bedding-in process. Under the reforms, GP-led bodies, called clinical commissioning groups (CCGs), will take charge of much of the NHS budget, replacing primary care trusts (PCTs) which will be scrapped. Sir David also warned the health service not to take its eye off the bigger picture. 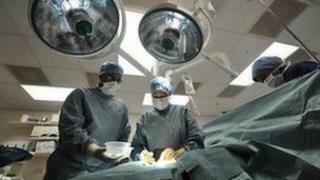 The NHS is at the start of a savings drive - it has been told to save £20bn by 2015 through becoming more productive. Sir David said the NHS had "started well" but more change was needed. His comments come as fresh fears have been raised that cuts will have to be made to the front-line of the NHS, if it is to cope. The government promised to protect the health service, but research by the King's Fund, based on interviews with 45 NHS finance chiefs, raises doubts. The majority said they were currently managing to make savings without harming care. But the think-tank said 19 expected care to get worse over the next few years, and that 2013 could mark the turning point, with only eight believing it would get better. Some 27 of the managers who took part in the online questionnaire also said there was now a high, or very high, risk that NHS would not meet its £20bn target. Meanwhile, a BBC survey of 1,005 people suggested 60% believed services would have to be cut. The poll, carried out by ComRes, asked members of the public in England a series of questions about the NHS. Some 61% agreed that they expected the NHS would have to stop providing some treatments and services in the future due to rising costs and increasing demands. Nearly three-quarters also said they did not trust the government with the health service. Prof John Appleby, chief economist at the King's Fund, said: "There are signs that future years will be harder. "The end of the public sector pay freeze next April may add to financial pressure and increase the strain on services. "The difficulty will be finding ways to absorb these costs without compromising the quality of care for patients." But health minister Lord Howe maintained the NHS was "on track" to achieve its savings target. He said £5.8bn was saved last year, while performance remained good. "Waiting times have been kept low, infections have been reduced, there are more doctors, more diagnostic tests and more planned operations," he added.